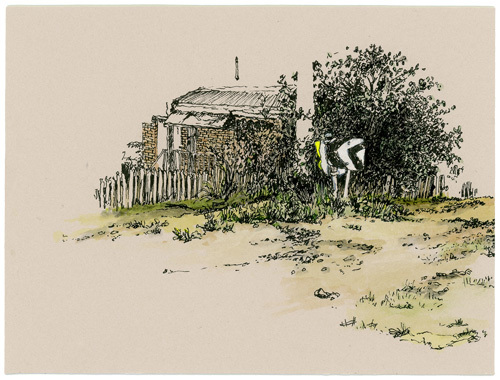 The Daily drawing series began in April 2010 whilst on residency at Hill End, NSW, Australia. Over seven years Wendy has completed more than 300 drawings. These drawings have been collected by institutions including Lake Macquarie City Gallery, Bathurst Regional Art Gallery, and the University of Sydney. The second Daily book Night & Day was launched at the Bathurst Regional Art Gallery, as part of the Bathurst Regional Art Gallery Hill End AIR Exhibition by the same name - Night & Day - Drawings by Wendy Murray. Includes written contributions by Maryanne Coutts, Sarah Gurich, Genevieve Carroll and Waratah Lahy. The Daily - Drawing Inspiration was released at the VOLUME 2017 Another Art Book Fair, Artspace Sydney. The Daily - Drawing Inspiration is a selection of Daily drawings by graphics artist and art educator Wendy Murray, with thoughts on drawing provided by Australian artists Genevieve Carroll, Scott Clement, Maryanne Coutts, Angus Fisher, Todd Fuller, Esther Neate, Catherine O'Donnell and Brenda Tye.